Designed collaboratively by LG and Google, Nexus 4, the newest smartphone in the Nexus line-up from Google, was announced today for avail-ability starting next month in select markets. With a sophisticated hardware design from LG, your favorite Google Apps, and the latest version of Android, Nexus 4 puts the best of Google in the palm of your hand. More about the Nexus 4 after the jump. All of this comes to life with stunning clarity and crisp, natural color on the vibrant 1280-by-768 4.7-inch True HD IPS Plus display supported by Zerogap Touch technology. Gently curved glass edges allow your finger to slide smoothly on and off the 320ppi screen, while cutting edge display technology means you feel like you're touch-ing every pixel, protected by scratch resistant Corning Gorilla Glass 2. Nexus 4 comes with a cutting-edge Qualcomm Snapdragon S4 Pro processor, so you've got speed and power to spare. Zip around the web, experience rich 3D graphics and gameplay, and effortlessly switch between multiple apps without ever missing a beat. With 2GB of RAM and the fastest version of Android ever, Nexus 4 is the snappiest Nexus smartphone yet. 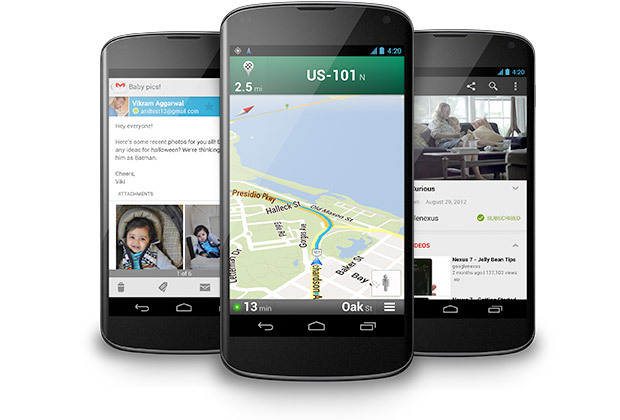 Nexus 4 comes with the latest Google apps, putting the best of Google in the palm of your hand. The latest version of Google Now is built-in, which keeps you even more organized – get reminders about upcoming flights, restaurant reservations, hotel confirmations and even nearby photo opportunities – when and where you need them. (10/30/12) The Nexus 4 (8GB variant) will retail for $299; 16GB variant for $349; available unlocked and without a contract on 11/13 on the Google Play store in the U.S., U.K., Australia, France, Germany, Spain and Canada. when will it be available in the Philippines and how much would it cost? it's amazingly priced for $299 for 8gb version.. i do not use much of the memory ..so it will be enough.. I only use it for few applications and few songs. This changed my mind from xperia p to nexus 4. It's really a bang for my bucks..